Apply quick details, waterless washes, and more quicker than ever! 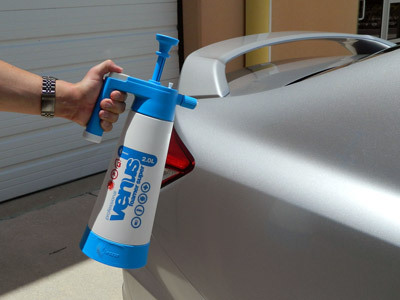 The Kwazar Venus Super Foamer is a chemical resistant pressure sprayer used to apply foaming agents, quick detailers, waterless washes, and more. The heavy duty design and large size (a full 2 liters!) makes it one of the most economical sprayers that we have; it’ll last you years! The Kwazar Venus Super Foamer brings you the convenience of a pressure sprayer without the hassle of big machinery. 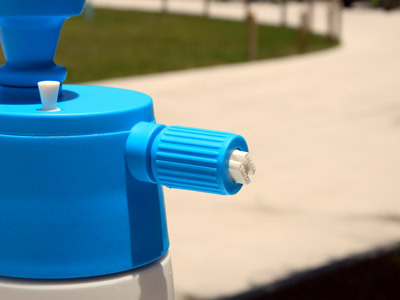 Simply build pressure by pumping the handle, located on top of the bottle. Once the desired pressure is reached, press the trigger with your thumb and spray away! When used with a foaming shampoo and water mixture, the Kwazar Venus Pro Super Foamer will give you foam similar to a visit to the car wash. When used with a quick detailer or waterless wash, even though those are not foaming products, you'll get an even and precisely applied layer. The Kwazar Venus Super Foamer Nozzle is adjustable, allowing you to control the stream of product from narrow to wide, depending on your usage. The full 2 liter size easily holds enough product to wash a whole car and detail the tires! As a precaution, the Kwazar Venus Pro Super Foamer comes equipped with a pressure release valve, should you need it. The clear strip along the side of the bottle indicates how much product is left. This Kwazar Venus Pro Super Foamer also has a stabilizing “apron” around the bottom of the bottle to ensure it won’t be knocked over easily. Whether you’re using it all day, or for just a quick wash, the Kwazar Venus Pro Super Foamer is the perfect tool to have on hand.